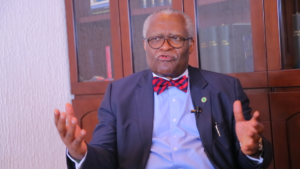 Barrister Akere Muna has debunked allegations by some newspapers and social media that he is using the Anglophone Crisis to vie for the 2018 presidential election. The International Legal luminary dispelled the claims on October 18, during a press conference at his Bastos residence in Yaounde. Speaking at the event, Akere said he is not manipulating the Anglophone Crisis for his candidacy. “My candidacy only coincided with the crisis. For those who know me very well, I started writing about the Anglophone Problem long ago. I wrote a letter to my Francophone brothers that you can find in the Internet and when it comes to the OHADA problem, I wrote an article in the 90s titled ‘Is OHADA Common Law Friendly?” he said. He equally added that he thinks there is a political path in the Anglophone Problem, which, to an extent, is not only the Anglophone Problem but the problem of the whole country because, according to him, we have a Government that is poorly managed and this has sparked all the problems we have now. “Through my candidacy, I am proposing a solution that will help solve the problem and the time to bring a solution is when there is a problem”, he stated. On accusations labeling him as an opportunist, the presidential hopeful said opportunism has two branches which are opportunity and violation of principles. “So when I hear people talk about opportunism, I laugh. I value my people and I have always been against bad governance and the fight against corruption. I believe these three things are causing us to have what we have today,” he explained. Going by him, it is based on this principle that he has decided to act now and he is hoping that people will understand that there is an election in less than a year and if we want to spend time being distracted by all the issues, then we will pay dearly. “Cameroonians as far as I know, are supporting and understanding and that is what we need to be able to move forward,” he added. To Akere, many who have seen him only in the Law firm are those who want to see him remain only in the law firm. Quizzed on what will happen to his candidacy if there is a coalition in the country, he said he has no problem with that. “In case of any coalition, I will follow the people’s choice because I am not running for the presidency for any hidden agenda. My father had the same problem in Nigeria and had to follow Foncha who was the people’s choice. So, I will also succumb to anyone the people propose as their choice in case of a coalition”, he noted. On the issue of funding the initiative, Akere said the doors are open for those who want to donate to help support the campaign. He equally disclosed that to stand as a presidential candidate in Cameroon, you must pay in FCFA 30 million as fee. “I am waiting for any Cameroonian who will donate even a symbolic FCFA 200 to support me. I also have resource persons and goodwill ambassadors who are equally ready to accompany me /us in this journey’, he said. Barrister Akere Muna, it should be underscored, is of the Honourable Society of Lincoln’s Inn. He was called to the Bar of England and Wales in 1978 and admitted into the Cameroon Bar in 1982. As a practicing Lawyer, he served two terms as the President of the Cameroon Bar Association; and subsequently served for a decade as President of the Pan-African Lawyers Union PALU, (3 Terms). Batonnier Akere was the first ever-elected President of the Economic, Social and Cultural Council of the African Union and has been a member of the High Level Panel on the Audit of the African Union. A distinguished member of Eminent Persons’ Panel of the African Peer Review Mechanism (APRM); he later on became the Chairperson. Batonnier Akere’s experience with international financial institutions includes serving as a consultant of the World Bank as well as the African Development Bank. He was a Member of the International Monetary Fund Consultative Group for Sub-Saharan Africa. He is a civil society activist and fierce defender of civil and political rights. Akere is widely recognised for his global leadership as a champion of good governance and anti-corruption. He is currently Chairperson of International Anti-corruption Conference; Sanctions Commissioner of the African Development Bank; Member of African Union’s High Level Panel on Illicit Financial Flows from Africa; and Chairperson of the Vetting Panel of the International Association of Athletics Federations (IAAF). He is Managing Partner of Muna and Muna Professional Civil Company, SCP. The presidential hopeful will, in the days ahead, engage in house-to-house meetings with some persons who have sent invitations to him in that regard.